A custom themed display for a Jurassic Park T-Rex tooth used in the original 1993 film. 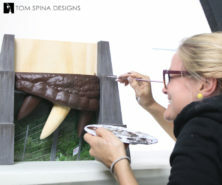 The client was originally displaying this Jurassic Park T-Rex tooth on a small, simple black stand, but they came to us looking for something larger and with theming to display this fun and unique movie prop. 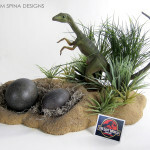 When it comes to creating themed displays for props or costumes there is a fine line that you need to tread carefully, so that you don’t overwhelm the piece. 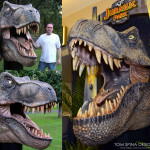 So instead of creating an entire tyrannosaurus head (which would’ve have been more than a bit over the top!) we created a very unique display, designed to incorporate elements from the movie like the classic Jurassic Park gates, the movie logo on a plaque, the lush jungle background and a small portion of a T-rex’s lip area. It sounds like a complex mix but ultimately created a cohesive, instantly recognizable and fun display for this animatronic prop tooth! 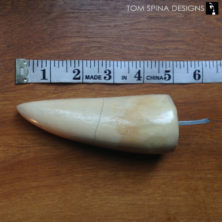 Careful choices in color and style help the original tooth prop remain the focus of the display. 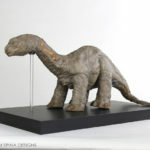 A replica section of T-rex skin and lip was sculpted to match the look of the dinosaurs in the original film. 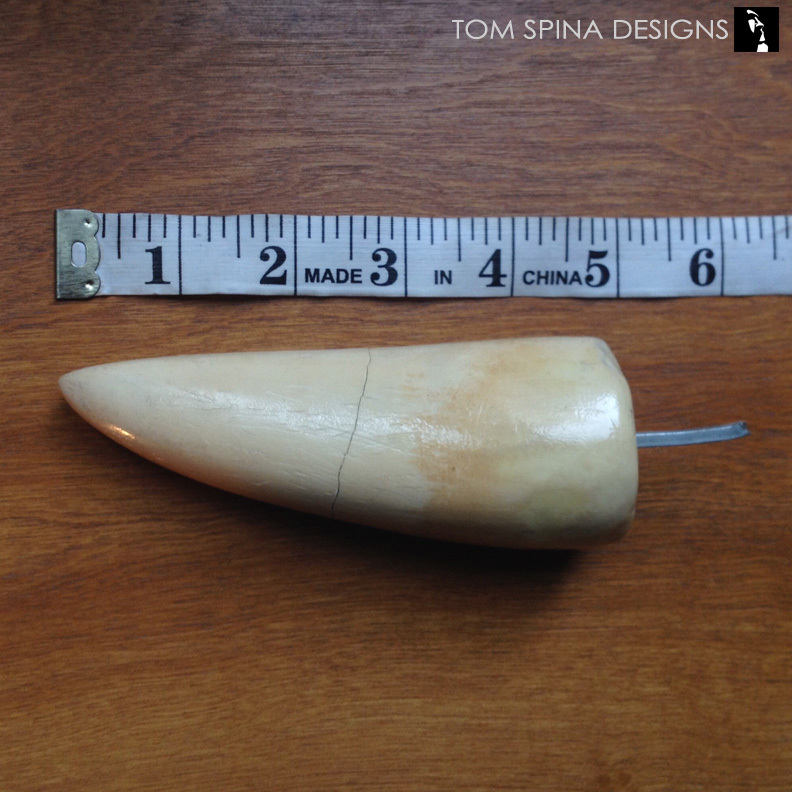 We created an additional tooth on either side, to put the prop in context. To keep the focus on the original, screen used tooth, we decided to make the entire head a distressed brown color which really allows the brighter tooth to pop and remain the focus of the display. Strong magnets actually hold the tooth in place w/o additional mechanical means. 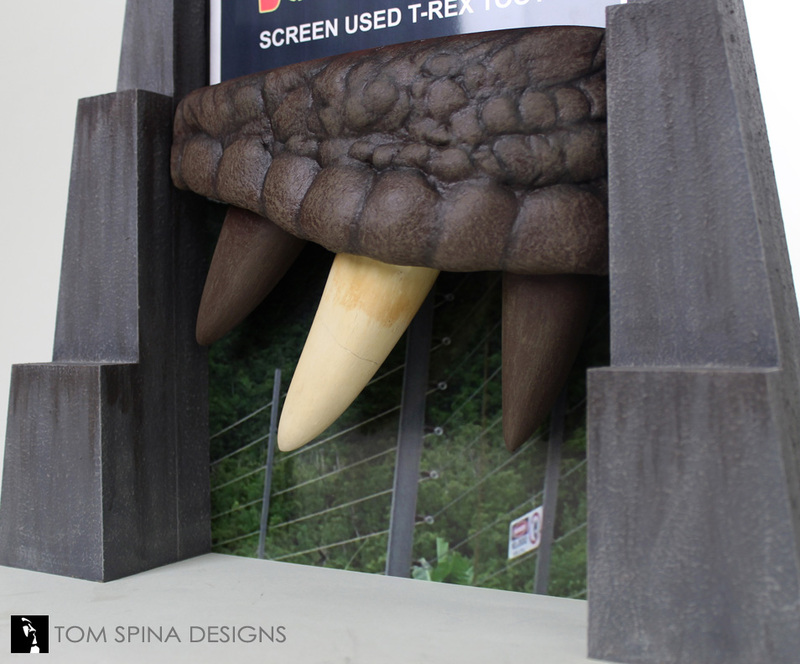 The two pyramid style sides of the base were made to evoke the look of the gateway entrance to Jurassic Park. The two uprights were created in layers of of wood, which we then textured, painted and distressed to look like aging stone. We also added a custom metal plaque which not describes the prop but also helps to bring the look of the park’s entrance together. 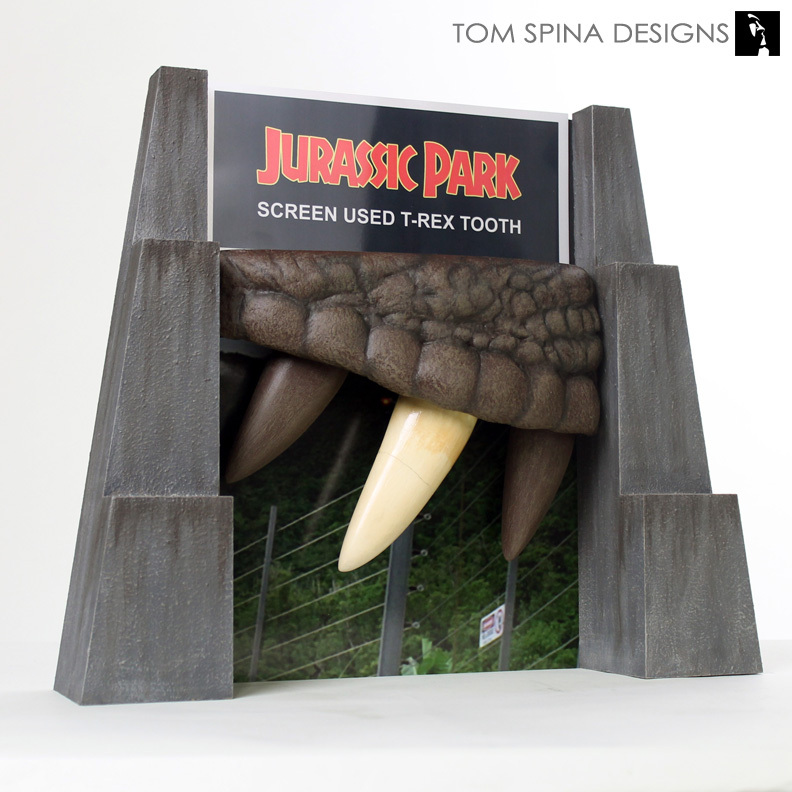 We finished off the T-rex tooth display with a printed background showing the lush jungles of the movie’s park and even a hint of the dinosaurs’ electrified security fence. Holy crap!, It’s perfect! 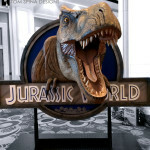 I love everything on this display, the gate, the background, and the T-Rex skin. 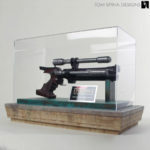 I really love that the display looks like a 3D/4D picture. You guys nailed it! Everything seems to look just fine. I hope you guys had a lot of fun with this project as mush as I loved seeing behind the scenes of this project.The display looks Spectacular! Thanks again!